This interactive presentation contains the latest oil & gas production data from 80,918 horizontal wells in 10 US states, through October last year. Cumulative oil and gas production from these wells reached 7.7 Gbo and 81.1 Tcf. October 2017 was another record month for US shale oil and gas production. About 10% more wells were completed in the first 10 months of the year, compared with 2016. Initial productivity was up as well, and together these 2 factors can explain the steady rise in output. Of course, as you can see in the individual basin posts, there are major differences across these plays. 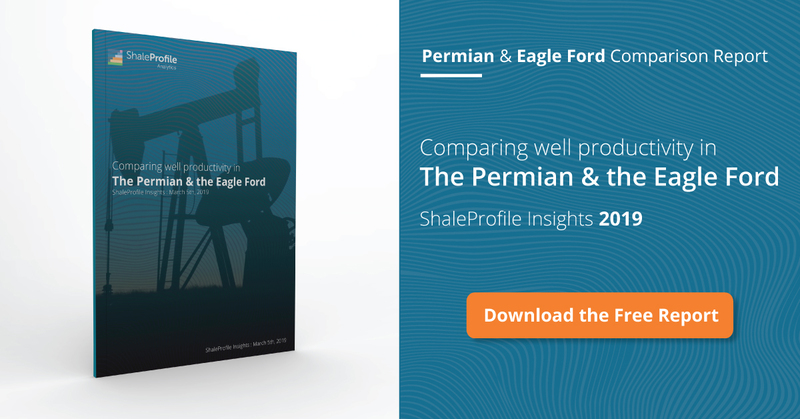 For example, the Eagle Ford failed to show any growth in this period, while oil output in the Niobrara in Colorado grew by an incredible 50%. You can also see this by selecting the individual basins in the ‘Basin’ selection below the graph. Part of the apparent small decline in older well production in September and October is caused by inconsistent reporting by the Texas RRC (new wells from some operators have production reported, but are not yet shown on the related lease. As Texas doesn’t provide well level production data, this new production is thus incorrectly allocated to older wells). The production profiles for all wells in the oily basins, averaged by starting year, are shown in the ‘Well quality’ tab. Not only do recent wells produce more oil, but if you change ‘Product’ to ‘gas’, you’ll note that gas production from these same wells has also been trending higher. Of the top 5 operators, based on historical operated production capacity, EOG was the only operator that set a new record in October, at 465 thousand bo/d (see the ‘Top operators’ dashboard), despite the impact of Harvey in August. As you can see here, the wells that started in 2016 are on a clearly higher recovery path than the 2011-2015 wells. The wells from before 2009 shown here are exclusively Bakken wells. If you change the ‘Show wells by’ selection to ‘Quarter of first flow’, you will see more recent and granular data. You will also then note that since Q3 2016, well productivity hasn’t increased further so far, which corresponds with the increase in drilling and completion activities. Next week I will have a new post on the Niobrara. The next update on North Dakota may have to wait until the first week of March. There is something that I quite don’t understand from the eia monthly reports. Between July and October, production outside federal offshore increased by more than 600 kb/d. This is a very steep increase in just 3 months, and the trend continued in November, 175 kb/d. From your actual data, oil from Hz drilling increased by 250 kb/d in these 3 months. No doubt that LTO is increasing, but even if we expect upward revisions, it seems unlikely to reach 600kb/d. Also, eia’s DPR is consistent with your numbers. So, my question is: Where does it come from? Was there some kind of spare capacity from some conventional fields that was restrained through the oil price plunge? My focus has always been so far on actually reported production data. The methodology the EIA is using is different in several aspects, so I prefer not to compare my numbers with the EIA directly. – Revisions in the Texas data. If you look at my older posts, and compare them with later ones, you can notice that Texas data for the most recent month gets typically revised upwards by around 5-10% (revisions for the other states are in general quite small). I expect some relationship between recent higher activity levels and more delays in final reporting. Therefore, I would not be surprised if eventually we will see an upward revision in the order of 150-250 kbo/d for Texas in October. – Oklahoma is not covered yet, and probably was partially responsible for this gap as well. – Maybe some rise in conventional production as well? Still, as mentioned, this is nothing more than a guess at the moment. I am also interested in improving this aspect, and hope to give more information about the incompleteness of recent production data in the future. Are the EOG oil numbers right? EOG reported in third quarter 2017 that oil production was 328K barrels/day. The numbers I show are always the gross operated volumes. Companies normally only report the net volumes they own (subtracting working & royalty interests, and adding interests they have in non-operated wells). Nodeywan, thanks for the link. Very interesting topic, that I also would like to further analyze. It is indeed interesting article, but so far it is not that obvious in other plays/basins as in EF. The data here clearly shows all other basins except EF show obvious improvement in first year IP and beyond so far. It will be more convincing to show that the IP and production per 1000′ in all basins to compare. Improvements were not enough. Higher productivity, “lower” costs(? ), and all the help OPEC and Russian could offer in the way of higher oil prices still did not help much in 2017: https://twitter.com/aeberman12/status/969963557952589824 A closer look at those few companies that did show profit in 2017, most of that was from one time tax charges, asset sales and changes in accounting methods. Russian and OPEC countries all need $80 oil to have real growth in their economy. The money burning trouble with new technology driven industries is not just with shale gas or oil. There will always be a gold-rush created bubble/over investment for new technologies. Take solar panel companies for example, all top 8 solar companies in the world have been bankrupted and burnt thru $300b and a lot more. The top 3 Chinese solar companies have to built over half a dozen giga-coal-firing power plants to support their solar panel expansions — what a way to become an empire! Take smartphone companies, all top 10 phone companies are all losing money or the money made per capital is not comparable to any low tech business except Apple and Samsung. The only hope is that US shale companies could have a consortium that more logically set their production, but that’s not free economy. Probably only possible when shale dusts settles and only the top 3 left to make money. The key here is the drain out OPEC and Russia first, and take the market share; while the worry should be are the technologically accessible resources enough to support such a plan? The OPEC led by Saudi did this to suppress US Shale, but failed, so now it is US shale’s turn. I see if differently. The only energy policy we have in America at the moment appears to be to drain our last remaining oil resources as fast as possible and to export it to foreign countries under an “energy dominance” agenda. Oil is being used as foreign policy tool. Be we do not have the reserves in the US to alter the world oil order, at least not for very long. Overleveraged oversupply of LTO ultimately drove the world price of oil down 65% in 2014; OPEC then raised its production rates to keep those prices low. The shale oil growth that has occurred since 2014 has all been achieved on credit. Before I’d go far as to say OPEC’s 2015-2016 plan “failed,” I’d like to see all that shale oil growth actually get paid for. Now the rhetoric from OPEC and Russia is that neither are very “worried” about US shale oil anymore. In fact they are encouraging it. They have cut production to facilitate a price that will allow more US shale oil growth, the accumulation of more debt, at an even faster rate of extraction. What I see on shaleprofile.com is that only 2-3 counties in each of America’s major shale oil basins carry the burden of America’s shale oil growth and sweet spots, in those counties, are getting hammered with new wells. So much so they are interfering with each other and rising GOR and ensuing depletion of those sweet spots is more and more evident. The rest of the world’s oil producing countries have computers. Those countries read SEC Q’s & K’s, know how marginally (un)profitable shale oil is, the headwinds it faces, all the debt, and they definitely know what sort of reasonably economically recoverable shale oil reserves are left in the US. OPEC and Russia are biding their time, allowing the US to win the BOPD sprint, while they are, in turn, running a marathon. None of this bodes well for the long term hydrocarbon health of America, unfortunately. Thank you, Nu. I simply included that link to show how the US stacks up with the world on 1P reserves. Enno’s work, and his website, is real data that is hard to refute; it will be around a very long time. Thank you, again. Nice website of the glory days of great west oil wells, Mike! Someday, if this website disappear, yours will still survive! I read that in the 1930~40’s, Los Angeles Basin alone supplies 25% of the world oil, larger share than Saudi. US used oil to control and forced Japan into war . I kinda agree with your view that US can not export without limit while in fact we don’t have enough to survive another decade. after all, even Art Berman propose that US’s deficit started in the early 70’s with oil flow reversed from export to import and the US need a rejuvenation one way or the other and better just from energy again .